Donkereweg 35, 4317 Zierikzee, Netherlands. Just outside the city of Zierikzee lies Schuddebeurs: a forest enclave, surrounded by the rural countryside of the Dutch province of Zeeland. Only a few hundred people inhabit this charming hamlet.Hostellerie Schuddebeurs - a 300 year old former inn/teahouse - is enclosed by splendid estates such as Heesterlust, Mon Plaisir and Zorgvlied. Over the years it has been thoroughly but extremely stylishly restored. This beautifully located and perfectly equipped hotel-restaurant bears an excellent national and international reputation. Hostellerie Schuddebeurs is open 7 days a week. Forest, Centre, Harbour, Near the historic centre, River, Countryside, Lake. No cancellation possible ( the entire reservation will be charged). Babybeds: 12.50 € for each additional babybed. Hostellerie Schuddebeurs has a firm and at the same time sparkling gastronomic reputation. Head chef Bart de Bree is at the head of a young, creative and very ambitious white brigade. Classical French cuisine is at the basis of their creations, but modern trends are given attention as well. For his creations, Bart de Bree makes use of the finest regional (seasonal) products, like oysters, mussels and eel, Grevelingen cockles, lamb from Schouwen-Duiveland, slightly saltish glasswort and sea lavender, Oosterschelde lobster and fresh fish from Stellendam. Hostellerie Schuddebeurs is affiliated to Relais Restaurants: a partnership of like-minded restaurant keepers whose starting-point is ‘Taste’. Just outside the city of Zierikzee lies Schuddebeurs: a forest enclave, surrounded by the rural countryside of the Dutch province of Zeeland. Only a few hundred people inhabit this charming hamlet. 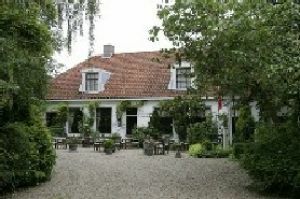 Hostellerie Schuddebeurs - a 300 year old former inn/teahouse - is enclosed by splendid estates such as Heesterlust, Mon Plaisir and Zorgvlied. Over the years it has been thoroughly but extremely stylishly restored. This beautifully located and perfectly equipped hotel-restaurant bears an excellent national and international reputation. 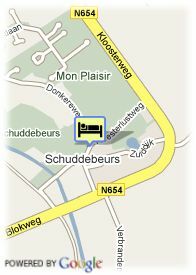 Hostellerie Schuddebeurs is open 7 days a week.